Now when a Scout excels in outdoor participation, there are new awards to show for it! This program includes a series of five badges designed to recognize a Boy Scout or Varsity Scout who has exemplary knowledge and experience in performing high-level outdoor activities. The award consists of five emblem segments positioned around the perimeter of a beautiful center emblem. All are embroidered in full color. The segments represent five areas of emphasis: Riding, Hiking, Camping, Aquatics, and Adventure, with rigorous requirements to earn each segment. The center emblem features an outdoor scene with fleur-de-lis and the words "National Outdoor Awards". 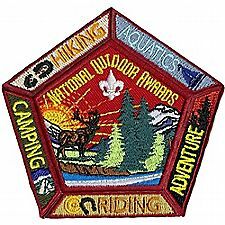 The five National Outdoor Badges recognize a Boy Scout or Varsity Scout who demonstrates both knowledge and experience in camping, hiking, aquatics, riding, or adventure. Scouts earning the National Outdoor badges have demonstrated that they are knowledgeable, safe, and comfortable in the outdoor activity covered by the badge. B. Horsemanship merit badge and 50 miles of horseback riding. 2. Complete either the Wilderness Survival or the Emergency Preparedness merit badge. Items 3a-g may be repeated as desired. A single activity that satisfies multiple items in 3a-g may be counted as separate activities at the discretion of the unit leader. Similarly, a single activity that doubles an item in 3a-d may be counted as two activities at the discretion of the unit leader. A gold device may be earned for each additional five activities. For more information or to download an application visit the National Council Website.